How often, or have you thought about your core ideologies and your future as a professional? I personally haven’t myself but as I lead my organization through a strategic planning process and as I learn more about how to develop successful organizations, I began to think about how I could apply that process for me personally. Using ideas from a book by Jim Collins called “Built to Last: Successful Habits of Visionary Companies”, I came up with some initial thoughts below. It’s a work in progress and they’re a product of quick brainstorming tonight so I know they’ll evolve as I have more opportunity to reflect deeper about my purpose and aspirations. I’m also revealing some of my honest (and maybe flawed) thinking at this point in my life. Nevertheless, I’m choosing to share them with you with the hope of encouraging you to also think about your vision. Trust, respect, and value diversity and inclusion of ideas. Deep value of community in the workplace. Lead through trust and collaboration. Committed to helping and making other people’s lives better. Treat people with dignity and respect. Committed to life-long and continuous learning. Find the goodness in others and help them fulfill their potential. Purpose: To contribute to the betterment of the society by promoting student success in higher education through technology and mentorship. Student success means students develop as “whole person” while they’re at the university and to prepare them for their next steps which could include attending grad school, getting a job, or following their passions. To become one of the most recognized practitioner/scholar experts in the field of higher education as a result of successful and proven leadership/implementation of transformative practices involving technology leading to dramatic improvement of student success in higher education. Together with researchers and scholars, will develop new theories or advance existing theories that reflect the current and future needs/interests of the diverse and changing higher education student demographics. Together with researchers/scholars/practitioners/vendors/students/technology professionals, will design and develop common standards and shared services n higher education that will enable information systems across institutions the ability to easily interface with each other, easy to implement, easy to use, and are learner-centered. What are your core ideologies and envisioned future? 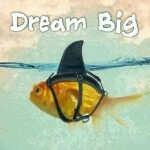 Setting big dreams is fun, isn’t it? My wife and I commute to work together and there are days when we talk about all the possibilities ahead of us. We figure it doesn’t cost us anything and if we’re going to dream anyway, we’ll dream big beyond our imaginations and beyond our realities as we see them now. Personally, thee last few months have proven to be fruitful so far. Some of what I consider Big Hairy Audacious Goals (BHAG) have come/or in the process of becoming realities. BHAG is a term I came across from the book called “Built To Last: Successful Habits of Visionary Companies” by Jim Collins. The idea behind BHAG in this book is that visionary companies used bold and daunting missions to stimulate progress. I just recently read the book so I didn’t know this term even existed but it seems the goals I had set for myself would qualify as BHAGs. They may not be audacious goals for other folks, but these goals certainly are for me. These personal BHAGs may not have been in the form I originally envisioned them to be, but nevertheless, they’re close to what I had in mind. In addition, some of these goals are personally scary for me. I figured I will just have to conquer my fears as I come across them. Another important note – these goals needed the help of other folks to make them happen! Without folks who believed in me and the ideas themselves, they would have never happened. A seat at the Senior Student Affairs Officers (SSAO) table in my role as IT Director. 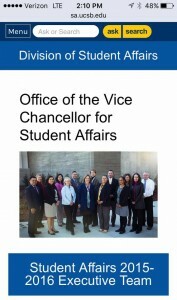 I became a member of my campus’ Student Affairs Executive Team in December. In this blog post, Case for Technology Leadership at the SSAO Table, I wrote about the values of having someone in a senior technology management role at the table who can bring technical expertise and perspective as strategic decisions are made. 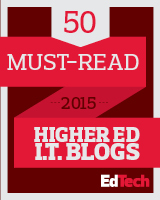 A campus-wide IT leadership/management professional development program. With the support of our new CIO Matt Hall, we have begun planning for a campus-wide program to promote community-building as well as leadership/mgmt and technical training for IT professionals. Along with our CIO, we have a team consisting of IT Directors as well as HR managers that’s in the process of formulating our goals and program activities. 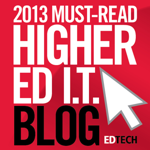 This is an idea I had proposed on this blog post – Cohort-Based IT Leadership Program for Higher Education. NASPA Technology Knowledge Community (TKC) Chair. This is a position that seemed out of reach for me and one that I may not be qualified for, given the significance and scope of the TKC. However, as mentioned in this post (Sharing Our Vision at #NASPA16: Updates from the TKC Chair), I think I can contribute to advancing technology in student affairs by broadening the scope of conversation and those involved in the discussions through the chair position. With the help of an amazing team, the community members, and the current chair, Lisa Endersby, I can’t wait to see what we’ll do in the next couple of years! 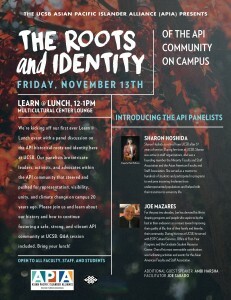 A webcast on student affairs and technology. A couple of weeks ago, the opportunity to do a webcast finally happened with the webcast “What AVPS and Mid-Level Professionals Need to Know About Technology” with Eric Stoller and Stephanie Gordon. It was a challenge for me given that I am not always sure of how much I know about the topic and how I may come across on a live discussion when folks are watching from all places. Lose 45 pounds in 10 months. Never in my wildest dream would I ever thought I’d accomplish this. After all, I’ve tried in the past to lose weight, but for various reasons, I just couldn’t make it happen. 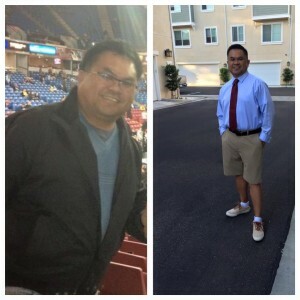 Here is a blog post, How I lost 20 Pounds in 3 Months, of what I found to work (written three months after I started the weight loss attempt). As I had mentioned, my wife and I have a list of BHAGs and those shall remain a secret to us and who knows if they’ll ever come to fruition. It is fun though to work towards them and to think about the possibilities. Professionally, I see the next three years as potentially significant for me. With a mixture of luck, preparation, and with the help of many folks – I do hope they’ll happen. The topic of social media and scholarship came up yesterday in the Research Institute of the NASPA Western Regional Conference in Oakland. One of the questions posed was “who defines legitimate source of knowledge?” As mentioned yesterday, when speaking with academic administration or faculty, one would probably cite academic journals and not blogs as they are not seen as scholarly publications. There are certain standards in the academy of what constitutes scholarly writing. I can accept the idea that blogs may not yet be considered as scholarly publications but what I will not accept is the idea is not blogs are not legitimate source of ideas, whether they are considered scholarly or not, especially ideas from those who have been marginalized and whose voices have not been heard. As one who has felt marginalized throughout my life and my career, my blog offers me the voice to be heard. No one is interrupting me when I am in the middle of writing a sentence. I write when my mind is free and when I want to. I often write my posts between midnight and three AM. Dr. Larry Roper, the former Provost for Student Affairs at Oregon State said this when he spoke at UC Santa Barbara years ago, “Please do not steal my pause…the best comes after the pause.” This is a challenge I’ve faced in my life as one who needs the time to think and find myself being interrupted in mid sentence when I’m speaking. Even worse is that when I am expressing my perspective that may not align with mainstream thinking because of my upbringing and cultural background, some of my ideas are quickly dismissed. 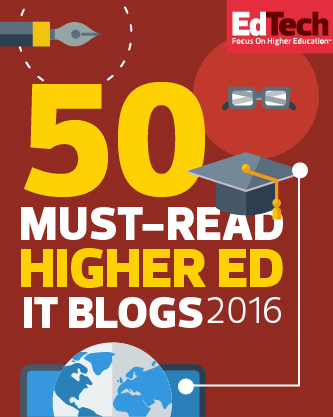 Social media, especially blogging, has allowed me to contribute to the conversations in the field of student affairs, higher education, and technology. It has also provided me the medium to share about my shared experience as an Asian-American. I know some of the topics I write about resonate with others as I get emails from others who tell me they can relate, including this recent post on my challenge as an Asian American leader and assertiveness. I don’t apologize for my thoughts even as they may sound ridiculous to others. Why should I? I have a perspective like everyone else. Whether they are “right” or “wrong” is in the eye of the reader but they are perspectives nevertheless. I have gotten tired of having to wait for others to allow me to speak because I may not have the three letters after my name or because I don’t sit in a high enough position at the university. I think marginalized folks can relate to the frustration of being silenced or dismissed. Blogging has provided me the opportunity to contribute my thoughts and express them in a way I want to. When I blog, I don’t always know how readers will interpret them, and I know there are consequences to what I write. However, what I write are my ideas shaped by my experience and struggles. No one is going to tell me, nor should they, that my personal truth as the way I only see them is not valid. When I started blogging, my intention was just to share my thoughts and I considered it as a public personal reflection. One of the unexpected outcomes has been the collaborations with other student affairs and technology professionals that share common interests with me. I’ve had discussions with others about the current and the future of student affairs and how technology should play in how we serve our students. As I’ve come to find out during these collaborations, there are other folks out there like me who have ideas yet they don’t have the medium to express them. For me, my blog has allowed me to contribute to the conversations and to connect with others. If you’ve felt marginalized and have felt your voice silenced – consider blogging. No one’s going to interrupt your thoughts while you’re writing and yes, there are consequence to what you write, but at least you’re sharing your unique ideas for others to read. Your ideas are too valuable to be kept in your head! Image courtesy of Carol Dinh. Student activism was the topic for this week’s #sachat session on Twitter. This is a weekly chat session for student affairs professionals and students interested in the profession. 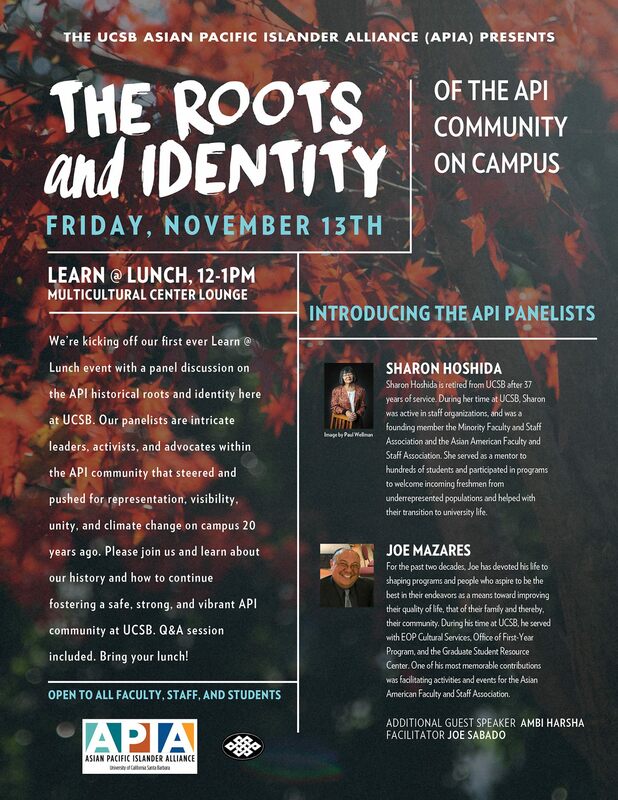 Coincidentally, the event I am facilitating called “The Roots and Identity of the API Community on Campus” to be held next week was also announced on Facebook today. The chat and the event reminded me of my student activism days at UCSB back in the 1990’s. 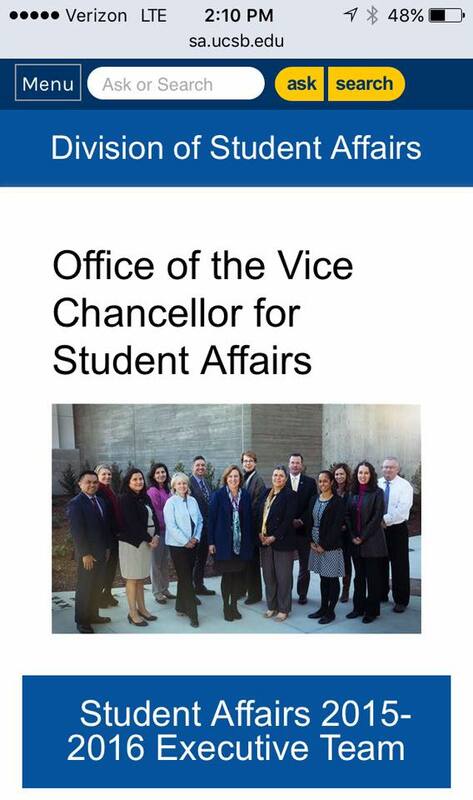 Back then, I was deeply involved within the Asian American student community to challenge/work with the administration to improve student services to better serve the needs of Asian American students and the student body in general. Some of the group’s efforts were directed towards making student services more culturally sensitive and for the counseling services experience more accommodating to Asian American students who may have come from cultures and family upbringings where professional counseling was a foreign concept or frowned upon. Another major effort undertaken by the students was the establishment of a physical space for Asian American students so we can have a place we can call home. After many years of working with the administration, the effort resulted in having a room identified as “Asian Resource Center” which led to a building now called Student Resource Building wherein several student service departments as well as resource centers for marginalized student populations are located. One of the most memorable moments when I was a student was when I called my mom letting her know I was involved in a student protest. My mom was furious at me for being part of it. She was also scared of what would happen to me. She yelled at me that I will go to jail. Her reactions were because of what we had seen in the Philippines growing up. When we left the Philippines in 1984, it was about the time of People Power Revolution that deposed Ferdinand Marcos, the President of the Philippines back then. During that time, we witnessed protests on the street in Baguio City where I grew up. My parents were never politically active so I never participated in the protests. My parents were also adamant about me not getting involved because of the fear of being arrested or other consequences. Looking back, one of the benefits in getting involved with student activism was developing my identity as a Filipino-American. Coupled with Asian American courses, including a Filipino-American Experience course, my involvement within the Asian American community provided me opportunities to learn about Asian American history as well as the opportunity to develop my racial and cultural identities. By being aware of the struggles of Asian-Americans throughout our history, oppressive laws like anti-miscegenation and racial discrimination and segregation practices, and how Filipino-American leaders like Pablo Manlapit, Philip Vera Cruz, Larry Itliong led movements to fight injustices, it led me to exploring what it meant to be a Filipino-American. I became more keen to the portrayals of Asian-Americans in the popular media. I also became more sensitive to micro-aggressions I faced everyday. I noticed how I was followed when I entered stores. I noticed how my White hall mates insisted I only got accepted to UCSB because of affirmative action. While I didn’t know it back then during my days as a student activist, I was going through an identity development process. As Kim’s Asian American Identity Development Theory suggests, I had gone through the following stages including ethnic awareness, White identification, awakening to social political consciousness, redirection, and incorporation. After graduation, I found a job at UCSB and to this day, I’m still at UCSB. As a professional, I became a staff advisor to several organizations, including the Filipino-American student organization called Kapatirang Pilipino, Pilipino Graduation, and Pilipino Cultural Night (PCN). It’s been interesting to mentor and observe the student leaders and watch them go through the similar identity development process I went through. I hope that their experience as student activists will help them in finding themselves and in their careers as it had done for me. Throughout my career, one personal trait that’s been perceived as negative when it came to my leadership style has been my assertiveness, or rather lack of. From the feedback I’ve received, I’ve been seen as not direct and not confrontational when dealing with conflicts. Whether that’s because of my personality or because of my cultural upbringing, I don’t know why I have not been seen as “assertive” as other folks would like me to be. However, when folks assess my assertiveness, they’re probably comparing it to other leaders either from their experience or what they see in popular media. I grew up in a Filipino household that values harmony and conflicts are dealt with in not-so-direct ways. When it came to conflict, saving face or preserving dignity of those involved, mattered a lot in my family and in the Filipino culture. In my career, these approaches have been in conflict with how those I work with expected me to deal with issues. Because I have not always been direct in confronting issues, I have been seen as weak and unsure of myself. Perhaps, others have expected me to be dominant and controlling. I’ve been more inclined to use influence and persuasion to lead. The challenge for me then has been reconciling my personal tendencies with the expectations of the workplace when it comes to being an assertive leader. Actually, the challenge has been on determining when to use the style I’m more comfortable with vs. what others may consider as assertive. As I think about this issue of assertiveness, I wonder which opportunities I missed because I was not seen as assertive leader. Moving forward, I wonder whether how this perception will shape my career. I also wonder about my prospect of moving up the management hierarchy in higher education where there’s a glaring lack of Asian American leaders who can mentor me, where my qualities may not match the Western qualities associated with leaders, and perhaps bias against me because I don’t fit the prototypical leader that hiring committees are comfortable hiring.